In the 1930s Warsaw was a thoroughly cosmopolitan, even swinging city. Larger than Chicago, it was host to a rich Jewish cultural life. It seemed inconceivable that all this was about to be swept away. But then came the dark events of September 1939 and Europe's headlong plunge into the horrors of Nazi tyranny. As German tanks rolled across Poland's borders, a ragtag army calling itself the Jewish Resistance Force fell into shape around the handsome, quick-witted Isaac Zuckerman. Impossibly daring, the Jewish Resistance Force would hold out until the end of the war, by which time fewer than one hundred of its members were still alive. Isaac's Army tells the thrilling and often astonishing tale of the exploits and varying fortunes of the Force's main participants. 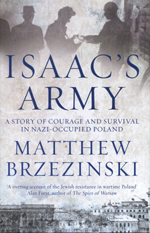 Told in vivid prose that brilliantly recreates an atmosphere of heroism, danger and desperate ingenuity, Isaac's Army is a rich and inspiring celebration of the resilience of the human spirit.